People are good. People in Grand Junction are good. And days like today are what make us honored and proud to serve this wonderful community. This day was highlighted by two events that on the surface may seem completely opposite, but that truly highlight the spirit of this community: Shop with a Cop at Mesa Mall followed by a solemn salute to a fallen hero. This morning we had the privilege of taking 11 kids on a shopping spree to buy gifts for their families, all thanks to the generous support of Mesa Mall, its merchants, and the Grand Junction Peace Officers Association. While the shopping itself is fun and full of laughter, it’s what the kids say that grabs our hearts. Take Alyssa, for example, who asked the cops she was shopping with if they could go to Boot Barn because there was a purse there that she really wanted. When she picked up the purse, she grinned from ear to ear. Then she spotted something else on the shelf; a watch. “I know my mom would LOVE this!” she said. She looked at the watch, looked at the purse, and looked at the watch again before saying, “I’m going to put the purse back. I really want my mom to have this watch.” Another little guy filled his cart with gifts for his four sisters. A TV news reporter interviewed him about what he thought of this event. His response? “If any kids happen to see this on TV I want them to know that if they don’t get any presents this Christmas they can have some of mine.” Yes, that made some of us tear up. These kids get it. They know what Christmas is all about. 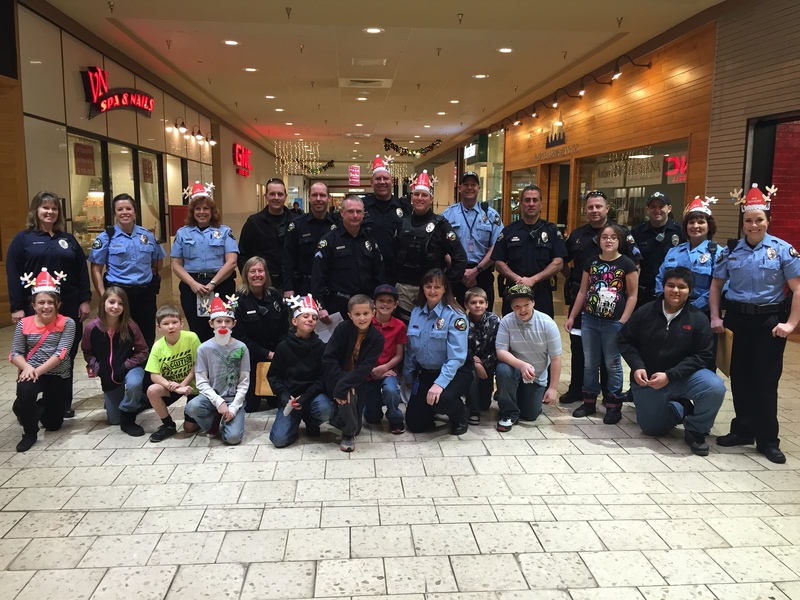 As Shop With a Cop was wrapping up, a new emotional event was just beginning in our city. Air Force Capt. William Dubois was returning to home to his heartbroken family in Colorado after being killed in a plane crash while serving in the Middle East. Our department had the honor of coordinating and leading the procession to the funeral home. 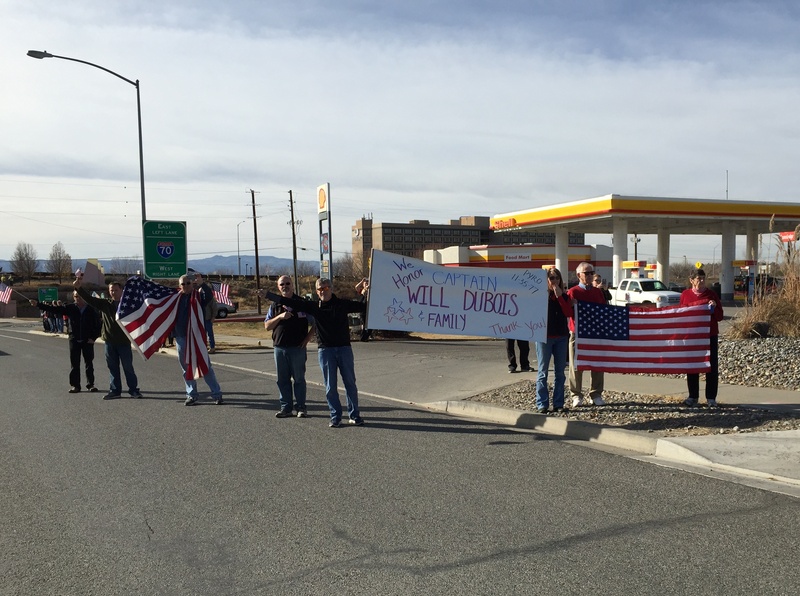 What happened in the streets of Grand Junction didn’t surprise us, but it is something we won’t soon forget. Nearly every inch of sidewalk, and in some parts of the route, the street itself, from the airport to Grand Ave. was lined with people holding flags, covering their hearts, and paying quiet respect for the young man who died serving our country. No words were needed, and in fact, no words could express the gratitude we and the people lining the streets have for Capt. Dubois and his family. We’ve included some short video clips from the procession, as this is the best way to understand what took place today. Thank you Grand Junction. Thank you for showing this world what we are all about in this community. We are truly honored and humbled to be part of it. Additional photos from both events can be found on our Facebook page. This entry was posted in GJPD News and tagged capt dubois, fallen hero, grand junction police, shop with a cop. This is a wonderful place to live. Great People. Thank you for posting this. Thank you for the rough jobs that you do.